Our team of dental professionals at Capitol Dentistry cares about you and the health of your smile. 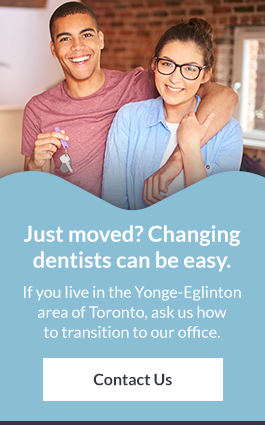 We're here to provide you and your family with the care and support you need at our Yonge and Eglinton dentist office. The best part of working at Capitol Dentistry is hearing patients tell us that they love coming to visit our team. We know that many people are afraid of the dentist so when they say that, it just makes us all smile. We try very hard to provide a welcoming and friendly environment. Working at the front desk means I get the chance to catch up with each and every patient. I love working at Capitol Dentistry and the team is always positive! As a dental assistant, I get to help Dr. Anderson through your dental procedure. If you are nervous or worried about your treatment, don’t worry there are many things we can do to make you feel comfortable. We have many years of experience calming the nerves of patients just like you. I look forward to getting to know you. See you soon! I enjoy coming to work each day - all because of our amazing patients! As a hygienist I get to know many exciting things about our patients lives. No day is ever the same as the last. We have seen generations of families come to our practice and have enjoyed watching them grow. We look forward to welcoming you to our family at Capitol Dentistry. I love my job! I get to help people smile which is the most rewarding part. The team at Capitol Dentistry is incredible! I like every opportunity I get to engage with my patients and share stories. Having a great time with my patients is the best part of my job. I really like coming into work each day - our team is amazing.